Dakshina Kannada District Court Hall Ticket 2019: The officials of the Dakshina Kannada District Court announced that admit cards will be issued in the month of February 2019. Moreover, the Stenographers, Typists, Typist – Copyists, Peons examination will be conducted in the month of March 2019 only for the eligible candidates. Hence, candidates can grab this opportunity. Refer to the coming sections for the complete information of the Admit Card. We have also provided the direct link to download the districts.ecourts.gov.in Hall Ticket 2019. The officials announced that the Dakshina Kannada District Court Admit Card 2019 will be published in the month of February 2019 through the official website. Soon after the official announcement of the admit card release date and the examination date, we will update the news through our page. This is a good opportunity and candidates can grab this chance. Furthermore, you can also get detailed information about the selection process in this article. The selection process for the Dakshina Kannada District Court Examination 2019 comprises of a WRITTEN TEST and an INTERVIEW. The candidates who receive the admit card should attend the written test along with the admit card. After the written test, the aspirants who score marks more than the cutoff marks will be selected for the next round i.e., interview round. Furthermore, the aspirants who clear the interview round will be finalized and they are recruited for the eligible posts. 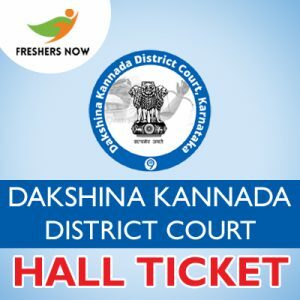 Candidates attending for the Dakshina Kannada District Court Examination 2019 should download the admit card. After downloading the admit card, candidates should check the details on the hall ticket. If there is any mistake in the details, then it should be resolved soon. The details may be in the same fashion provided below. Aspirants about to attend the examination should refer to this section. Candidates should download the districts.ecourts.gov.in Hall Ticket 2019 before the exam. Without the hall ticket, candidates are not allowed to write the examination. Additionally, aspirants should also carry some other documents for the exam. There will be a verification process conducted by the examiner for security purpose. Moreover, candidates should submit some mandatory documents in the verification process. The list of the mandatory documents is given below. This section is very useful for the candidates about to attend for the Dakshina Kannada District Court Examination 2019. Moreover, aspirants who feel confused about the downloading process can refer to this section for a clear view. In this section, we provide you with the complete downloading process for the admit card. Initially, candidates should visit the official website of the Dakshina Kannada District Court i.e., districts.ecourts.gov.in. and you can find the drop box at the top left corner. In that drop box, select the state name from the list of states. Additionally, besides the dropbox, you can find the search box. You can also search for the desired admit card in the search box. Then, you will get the admit card link. Make a click on that link and fill the details in the required fields. Moreover, Check the details once again before submitting them. Download and take two or more xerox copies of the admit card. For any queries, you can contact us at freshersnow.com. All the best for all the aspirants.